Double issue of Sempé Fi today. 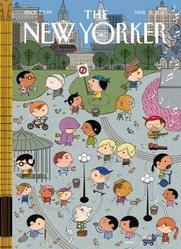 Now we’re going to look at Ivan Brunetti’s cover for the May 31, 2010 issue of The New Yorker. It’s called “Union Square,” and depicts this New York landmark crowded with Brunetti’s typically diminutive, big-headed figures (Brunetti’s covers are easily recognizable). Even Henry Kirke Brown’s 1856 equestrian statue of George Washington is re-imagined in Brunettian form. Union Square is usually the focal point for political protests. Brunetti’s Union Square has many people, but only of them can be described as a protestor: she wars a bandanna and holds a sign calling for the ban of something. 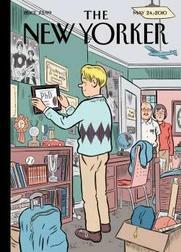 And certainly the parents featured on Daniel Clowes’ cover for the May 24, 2010 issue of The New Yorker look dismayed to see the return of their adult son. Clowes’ cover, called “Boomerang Generation,” refers to a social phenomenon of our time: grown children, often college graduates, who are retying the apron strings. 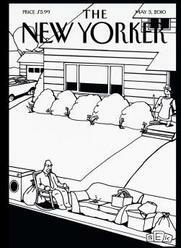 The May 17, 2010 issue of The New Yorker was The Innovators Issue. The issue’s cover, called “Novel Approach,” by the Dutch artist Joost Swarte, captures the process of invention and inspiration, and the insanity that drives them both. In the 17th and 18th centuries, scientists and thinkers were obsessed with solving the problem of longitude. In our own day, we are concerned with solving the issue of global warming. Some New Yorker covers require some explanation, and this is certainly the case with the cover for the May 10, 2010 issue of The New Yorker. Sempé Fi is here to help. 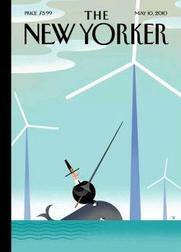 Bob Staake’s “Tilt” features a Pilgrim riding a whale tilting a lance at a wind farm in the middle of the ocean. The imagery, and title, refer to Don Quixote. The focus of the cover, however, is on the waters off Massachusetts (hence the Pilgrim) rather than the sun-drenched fields of La Mancha. Specifically, the covers refers to the controversial Cape Wind project, the United States’ first offshore wind farm. 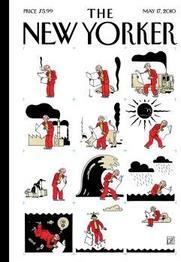 The work of Bruce Eric Kaplan, also known by the shorthand of BEK, graces both the inside and the outside of the May 3 issue of The New Yorker. That’s quite a coup for an artist who used to live “in a space that was meant to hold just one car and maybe some old boxes or tools or whatever it is people put in (half of) a garage” and submitted cartoons to The New Yorker for three years before one was accepted.